A Goodwill spokeswoman said Monday that the store on The Concourse was to open at noon after being closed Sunday and Monday morning because of a water main break that caused a flood Sunday behind the store and filled the basement with eight feet of water. WATERVILLE — A broken water main behind the mall on The Concourse is fixed, the flood behind the mall there is gone and 8 feet of water has been pumped out of the basement of the Goodwill store. Steeves, who was on her way to the Waterville store late Monday morning, said the store was closed all day Sunday and part of Monday and it reopened at noon. Losing a day and a half was difficult, however, because store revenues go to workforce programs and a day program for adults with disabilities, she said. “We’ll be okay, especially if the community comes out and shows some extra support for the store,” Steeves said. A 12-inch water main installed in 1966 behind the mall broke early Sunday morning, flooding the area behind the mall with up to 5 feet of water. The Waterville Fire Department, Public Works Department, Kennebec Water District, Waterville Sewerage District, Central Maine Power Co. and AmeriGas responded to the scene after 7 a.m. 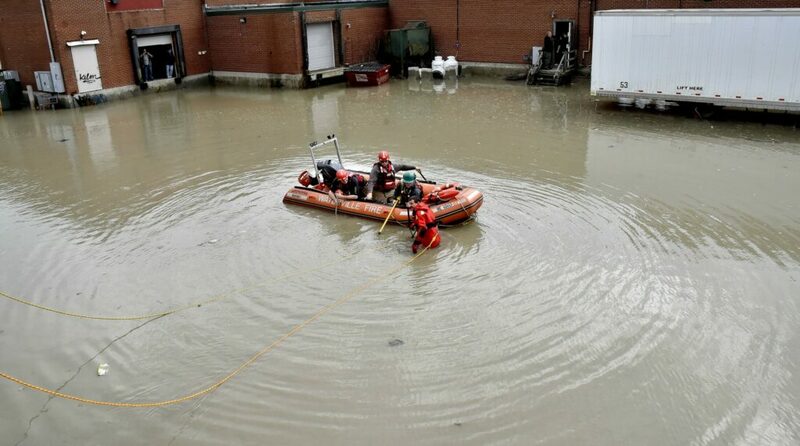 Firefighters launched a rescue boat in the flood and Firefighter Drew Corey, dressed in a cold water suit and using a metal detector, located a plugged storm drain underwater and cleared it so the water could get into the drain. Two other drains also were cleared. Firefighters pumped water out of the Goodwill basement, which had an estimated 8 feet of water. 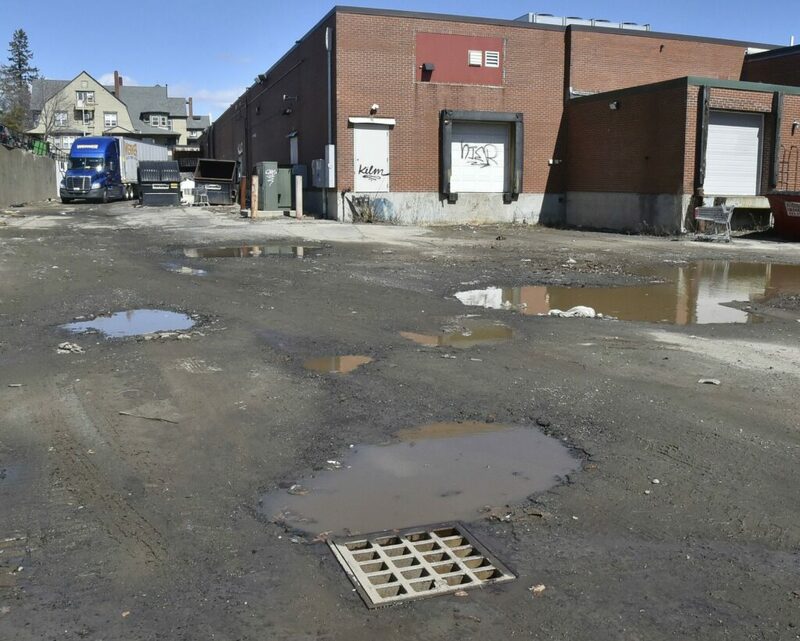 Roger Crouse, the Water District’s general manager, said Monday that workers had repaired the water main break and had it re-pressurized by mid-afternoon Sunday. The water shutdown affected only the businesses along the mall. CMP shut off power Sunday to those businesses also. The water main break had caused significant pressure disruption to a lot of customers in the area but that disruption was temporary until the Water District got a valve closed down, according to Crouse. He said the disruption lasted between 45 and 50 minutes. “Actually, it was a really nice shutdown, as far as those go, and a limited number of customers were impacted by the shutdown,” he said Monday. 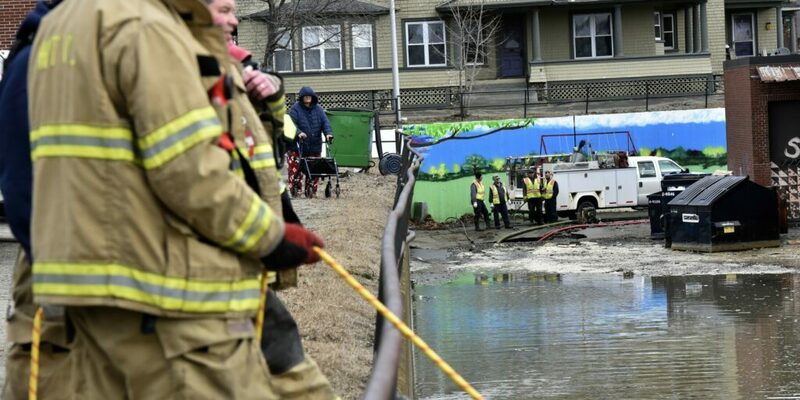 Waterville Fire Chief Shawn Esler, who also was at the scene Sunday, said Monday that he understood no other basements besides Goodwill’s in the mall flooded and there was no significant damage to those businesses. There was damage, however, from some propane tanks behind the mall that went under water and moved and shifted. Electrical boxes also had been in the water. Esler said the fire department remained at the scene until Sunday evening, pumping all the water out of the Goodwill basement. The Water District, CMP, Sewerage District and other agencies put a lot of time into the incident, according to Esler. “We talked to the Goodwill people yesterday — the owner and the property manager for Goodwill, and they said they’d have somebody come in and clean up everything,” he said.